Department of SSB Odisha. The educational qualification for the candidates is should passed Bachelor’s Degree with computer course certificate. Interested and eligible candidates can apply for the junior assistant posts through online mode. The official website of SSB Odisha for applying these posts is www.ssbodisha.nic.in. The online applications start from 26-09-2018 onwards. The closing date for apply online application forms is 25-10-2018. The candidates will be shortlisted based on merit in written test and computer skill test. 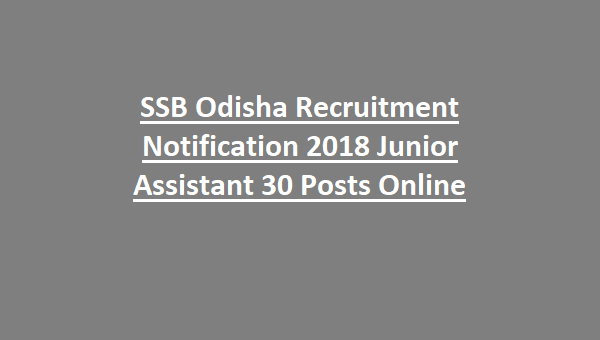 For the more details of age limit, salary, application fee and hoe to apply are given below for the 30 Junior Assistant posts in Higher Education Department of SSB Odisha Recruitment Notification 2018. Post Name and Available vacancies are given below. And 1 (one) Post will be reserved for visually impaired out of 30 posts. The age limit for the candidates belongs to General category is in between 21 – 32 years. 5 years upper age limit relaxation will be applicable for the candidates belongs to SC/ST/SEBC/Ex-servicemen. 10 years age limit relaxation will be applicable for PWD candidates whose disability is less than 40%. The educational qualification for the candidates apply for the Junior Assistant posts in Higher Education Department of SSB Odisha is Candidates should be passed in Bachelor’s Degree and having the computer course certificate. The salary for the selected candidates for Junior Assistant Posts in SSB Odisha is Rs.19900/-. The application fee for applying the Junior Assistant posts in SSB Odisha for the General Category candidates is Rs.800/-. The application fee for SC/ST/PWD’s category candidates is Rs.400/-. The candidates will be shortlisted based on merit in written test and computer skill test for total 200 marks. Written test will be conducted for 160 marks and computer test will be of 40 marks. The Written exam question paper will be consisting of multiple choice questions and duration of exam will be 3 hours. The written exam will be conducted on following subjects. Reasoning and Mental ability – 40 marks. On the basis of total marks secured by the candidates in the written test will be called for computer skill test by SSB. 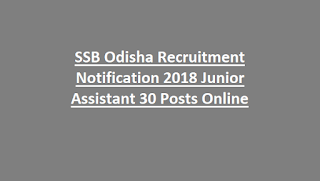 Interested candidates can apply for the Junior Assistant posts through online official website of SSB Odisha is http://www.ssbodisha.nic.in/ from 26-09-2018. The last date for submission of application form through online is before 25-10-2018. The candidates can pay the application fee at the time of form submission. For written Examination candidates will be download the Admit Card from the official website of SSB Odisha. For more details candidates can check in the official notification.